The most ambitious astronomical survey ever taken, the Sloan Digital Sky Survey-which began in 1991 and involved hundreds of scientists around the world-is sometimes described as astronomy’s equivalent of the Human Genome Project. When complete, it will provide detailed optical images covering more than a quarter of the sky, as well as a three-dimensional map of millions of galaxies and quasars. 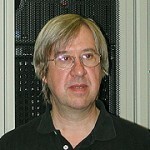 The development of SkyServer, in particular, benefited greatly from Szalay’s collaboration with Jim Gray of Microsoft Research, who worked with the Johns Hopkins team on that and several other large-scale, high-performance scientific databases.